333 Grand in the Liberty Harbor area of Jersey City is an iconic showcase of energy efficient, decorative exterior insulation & finish systems. Located on 2,500 feet of waterfront in the lower Hudson Bay, the Liberty Harbor area in Jersey City, N.J. provides magnificent views of New York Harbor. It’s a commuters’ haven due to its proximity to Manhattan and the area’s excellent public transportation system. An urbanist-inspired vision has spurred development in the area, including the recent completion of 333 Grand — an 18-story, residential apartment building offering the latest in luxury and style. With an iconic facade, wide sidewalk area and extensive amenities that include ground floor retail space, 333 Grand is a coveted waterfront address. The building’s exterior is especially decorative, featuring a stunning curved façade, oversized windows, multiple textured surfaces and vibrant colors. 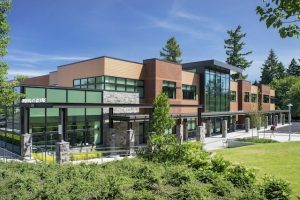 In fact, the 80,000 square-foot, multi-family, mixed-use complex is a signature representation of today’s high-caliber exterior insulation and finish systems. Developer Peter Mocco and his architects at Urban Architecture wanted an exterior wall system for 333 Grand that would serve as an effective air and moisture barrier to weather the elements, but they didn’t want to compromise on aesthetics. With specifications calling for multiple cladding types and shapes, the designers realized it was going to be impossible to develop the structure they wanted with standard building materials. So they turned to a StoTherm® ci wall system incorporating Sto Limestone and StoCreativ® Brick specialty finishes. The StoTherm® ci EPS-based, high performance, integrated wall system offered both sustainability and design flexibility. It includes a seamless, fluid-applied air and moisture barrier with continuous insulation (ci) and advanced drainage capabilities. The StoTherm® ci system improves indoor comfort and air quality while maintaining maximum curb appeal and lowering overall life-cycle costs. Mocco was especially pleased with the classic look of the StoCreativ Brick – a cost effective, energy efficient, lightweight, easy-to-apply decorative wall finish system. Using self-adhering stencils applied over a primer layer to create the appearance of mortar, this finish system offers a sustainable alternative to heavier brick, while avoiding the hassle of dealing with multiple trades and cumbersome accessories. The water-resistant Sto Limestone Finish provided an extra layer of protection, repelling moisture and wind-driven rain. A lightweight and easily installed architectural wall finish, Sto Limestone provided the classic look and feel of natural stone at a fraction of the expense. When designed as part of a Sto cladding system, this durable 100% acrylic finish can create the appearance of stone arches, reliefs and other distinctive architectural features. The new Element Music Row -- a luxury apartment high rise in Nashville -- used StoTherm ci Essence to ensure the building's energy efficiency. One of Sto Corp’s signature exterior insulation finish projects is now being featured as a case study on the EIMA website. Last year, working with Southern Wall Systems and Humphreys & Partners Architects, Sto helped incorporate a continuous exterior insulation system, and a continuous air and moisture barrier with high-performance finishes to protect the new Element Music Row highrise in midtown Nashville. The $100 million luxury apartment complex, is a 19-story, 431-unit building located in the heart of the country & western music capital of the world. The upscale new residence offers commanding views of downtown Nashville and easy access to all the shopping, dining and entertainment on Music Row. StoTherm ci Essence – a decorative and protective exterior wall cladding that combines superior air and weather tightness with excellent thermal performance and durability – was the wall system of choice for the new structure, ensuring the building’s energy efficiency, aesthetics, and air-moisture control. Because of the inclusion of Sto products and other energy saving efforts, the developers are showcasing the building as a model “green living” environment that is, in fact, LEED certified. The Element is located on Demonbreun (pronounced de-MUN-bree-un) Street in Nashville – an area that has become a symbol of urban revitalization for the music capital and a favorite venue for the city’s young, plugged-in professionals. Private development is booming in the area, and developers like Element’s Childress Klein out of Charlotte, N.C. are looking to build upscale living spaces, Class A office buildings and tourist destinations. The science of exterior walls has been well-documented; look for our three-part series that starts next week. Starting next week, ARCHITRENDS is launching a three-part series on building better walls, thanks to a big assist from the Building Science Corporation (BSC) – a consulting and full-service architecture firm for commercial, institutional and residential buildings. An internationally recognized organization, BSC’s focus is preventing and resolving problems related to building design, construction and operation. Probably best known for their expertise in moisture dynamics, indoor air quality and forensic investigations into building failure, BSC advocates for sustainable design, energy efficiency and environmental responsibility in building technology. Their website www.Buildingscience.com is a free online resource. As BSC points out, if you can’t keep the rain out, don’t waste your time on the air. If you can’t keep the air out, don’t waste your time on the vapor and forget about thermal. The perfect wall includes a water control layer, with an air control layer and vapor control layer positioned directly on the structure, and a thermal control layer covering the other control layers. Expansion, contraction, corrosion, decay, ultra violet radiation (basically, most bad things!) are all functions of variations in temperature. So, control layers need to go on the outside to help the structure weather temperature extremes and protect it from water in its various forms, as well as ultra violet radiation. The “clever” wall, as BSC calls it, uses building material that combines all four controls. Thus, air moisture barrier systems (AMBs) and exterior insulation finish systems (EIFS). The most “clever” walls utilize integrated, stand-alone systems that can work together to form a waterproof air barrier for all types of vertical, above-grade wall surfaces, engineered for fast, easy application. (Example: StoGuard) These continuous-insulation (ci) wall systems can provide superior air and weather tightness, long-lasting thermal performance, durability and are available in a wide range of decorative and protective finishes. Look for PART ONE in our series next week; it will focus on Moisture Control. Mesh is one of the most important components in an effective EIFS installation. We’re all familiar with the power that comes from teamwork, including the teamwork involved in constructing buildings. Whether its design, systems, skilled labor or the products used in construction – all the pieces need to fit together to form a cohesive structure. Like all teams, there is always a member that helps strengthen the group and allows contributors to perform better. For EIFS (Exterior Insulation and Finish Systems) that critical impact player, providing additional team support, comes in the form of reinforcing mesh. EIFS are typically made up of several different layers, and reinforcing mesh is one of the strongest components enhancing the performance, durability and aesthetics of the system. Mesh works a bit like a bulletproof vest: the network of fibers in the vest works together to redistribute and absorb the impact of a bullet. Mesh helps redistribute stresses on a wall surface more evenly, thus providing additional strength. 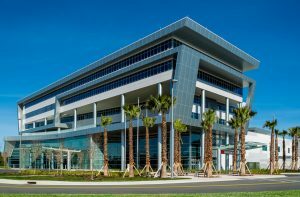 Mesh forms the center of the EIFS defense in a fire or a Category 5 hurricane, assuming it is mesh that has passed a barrage of third-party EIFS testing — from NFPA 285 (fire performance testing) to Miami-Dade County Hurricane testing. 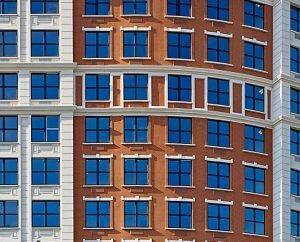 It is incumbent on EIFS manufacturers to test and qualify all components of their systems to ensure the safety compliance and performance resilience of a building. 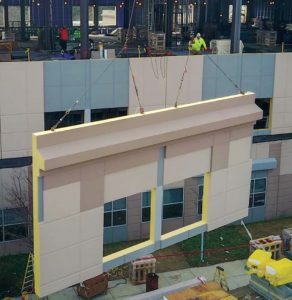 And it’s just as important for EIFS installers to be a part of the team, to only use tested, proven mesh products and to follow instructions for proper installation of the mesh.